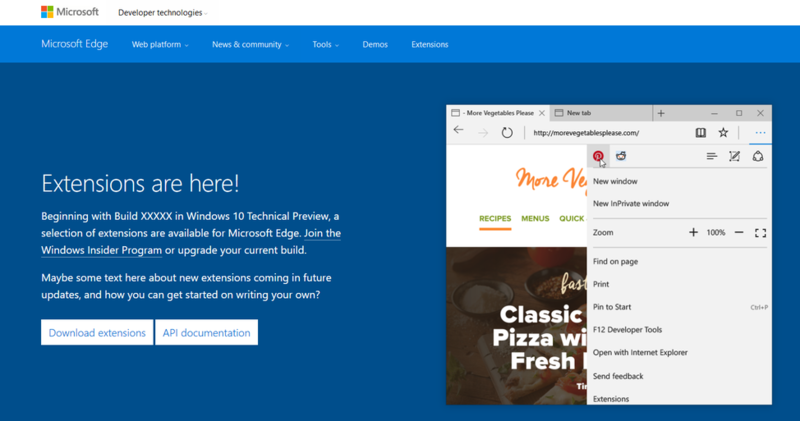 One of the major shortcomings of Microsoft's new Edge browser is the fact that it doesn't yet support the use of extensions. That may be changing in the near future, however, as the Redmond-based company prematurely (and promptly pulled) a webpage offering up a pair of extensions for Windows Insiders to try. The two extensions in question were for Pinterest and Reddit (the Reddit Enhancement Suite). The former extension adds a Pin-It button to Edge while the latter adds a bit more functionality to the popular social networking / entertainment / news site. Twitter user @h0x0d (aka WalkingCat) was the first to discover the page and managed to capture some screenshots before Microsoft took it down. WalkingCat has since made the extensions available for download via mega.nz. Microsoft was expected to introduce extension support in its most recent major Windows 10 update but those plans were ultimately put on hold. The release date is now rumored for either the end of this year or in early 2016. Once they do finally arrive, they'll likely be offered up through the Windows Store. Have you given Microsoft's Edge browser a try yet? If so, what are your thoughts on it? If not, what's holding you back? Is it the lack of extension support or have you not made the move to Windows 10 yet? Either way, feel free to chime in below.